Prayagraj : Prime Minister Narendra Modi took a holy dip at Kumbh in Prayagraj on Sunday. He also greeted Swachha Grahis, fire department personnel, security personnel for their dedication in services. 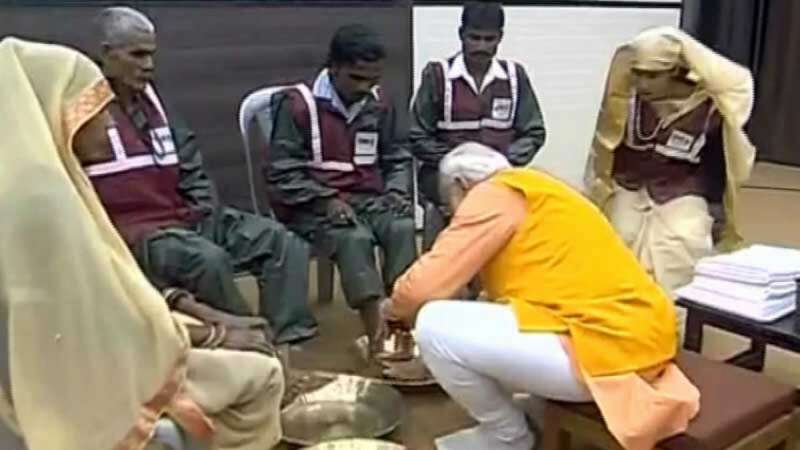 PM Modi also washed off the feet of the sanitation workers. Later, PM Modi said that he will never forget the moment of washing their feets. “It was a big responsibility to keep clean an area where 20-22 crore people had gathered. You have proved there is nothing impossible in the world. I salute each and every person making a contribution towards a Swachh Bharat,” he said. Prior to the holy dip he participated in the ‘Triveni Puja’ conducted by a group of priests. He offered milk, fruits, a red sari and chandan to the holy rivers. During his visit to Kumb, PM Narendra Modi was accompanied by the CM Yogi Adityanath and state Bharatiya Janata Party (BJP) chief Mahendra Nath Pandey.